Greetings Anglers! I hope everyone is able to get out and enjoy this beautiful state that we live in! Despite the dry summer it seems that the trees don’t really care and are putting on quite the display for us. And we are getting rain, which makes the trees and us happy right? The recent spell of rain seems to have got the fish (trout) kicked into feeding mode, especially on the tribs. 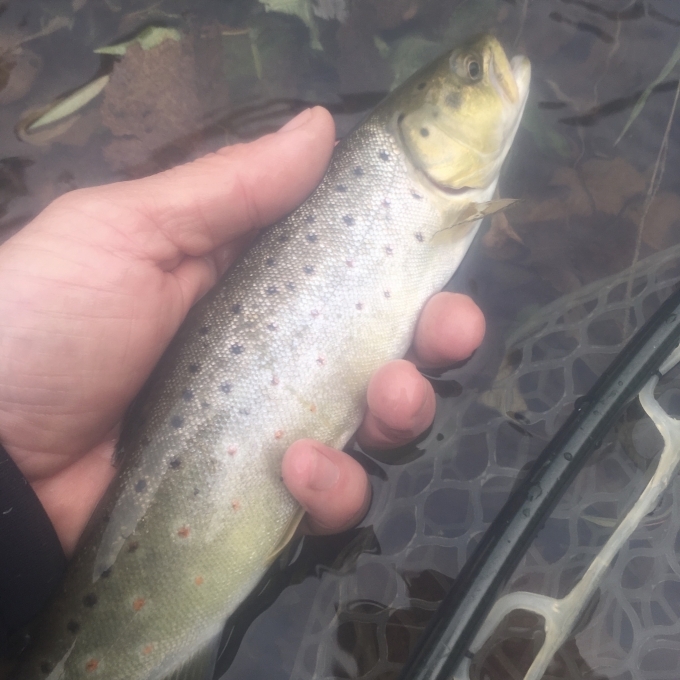 After a couple slow days on the Creek, I had a productive few hours on the Middlebury today, with nicely stained water and a ton of leaves to catch! Fortunately, the trout were also latching on to my flies today. With the stained and elevated water today I had luck with squirmy worms, small natural streamers and nymphed small buggers. Steve had some good luck this morning with clients on the New Haven with nymphs, the Hare On Fire, which is a hares ear with some rubber legs and orange mixed in. My small buggers were brown but had a copper bead, so I think the key with the water conditions was to make the flies stand out a bit. With tons of leaves floating by, the trout seem to need something else to key in on. The streamer bite was a bit slow, but natural colors produced more than white. Water temps that I found were still in the upper 50’s and fished seemed to be adjacent to some deeper runs. They were not in slow water, but more prime lies, meaning current with some protection. Looking forward, with cooler temps on the horizon, its time to dial in that nymphing and streamer game for the remaining regular trout season. As the fish look to fatten up for the winter, many well presented offerings should get good notice. It’s a good time to bust out the junk nymphs— stoneflies, worms, eggs and mops to name a few as the fish look for caloric intake. Same goes for streamers. I’ve also had good succes this time of the year with flies that have some bit of orange in them, whether with dubbing or a hot spot. A couple of other things to keep in mind heading forward. The Creek is up and with the rain they got down south, will probably stay up for a bit. Also, because the trees are not soaking up water like they would during the spring and summer, much of the rain will run off, so don’t be surprised if streams get higher, more quickly. Also, our wild brown and brook trout are looking to produce offspring this time of year, so careful where you step in our streams. If you don’t know what a redd looks like, please search it out on the inter web. We need these wild fish to reproduce as this strain has the genetics to withstand our fluctuations in heat and cool throughout the year. We are still guiding, with a bunch of trips this weekend, so we’ll have some up to date intel as the weekend goes along. And despite the closing of the season at the end of the month, we can and will still guide, conditions permitting, after the close of the regular season. Feel free to ask in the shop or email me dave@mmvt.com for some up to date conditions. Have a great weekend everyone, take time to admire our beautiful state.